As with most children in their generation, my kids LOVE the movie Frozen. Most days “Let it Go” is sung multiple times. “Reindeer are better than people” is said throughout the day. And the first DVD was worn out. We are now watching the Frozen Sing Along Edition at least once a week, if not more. But at least they love eating carrots like Sven now! As this is our first year homeschooling, I’m trying to make learning fun. Some days I do better than others. Since “Frozen” is loved and familiar, I thought this would be perfect. While I do love a good glitter craft, to say I was super excited to find glitter glue at the store was an understatement. No glitter or food dye needed. empty contents of bottle into a glass container. a perfect job for kids to help with. once bottle is empty, fill with water and pour into the glass container with the glue. mix well. 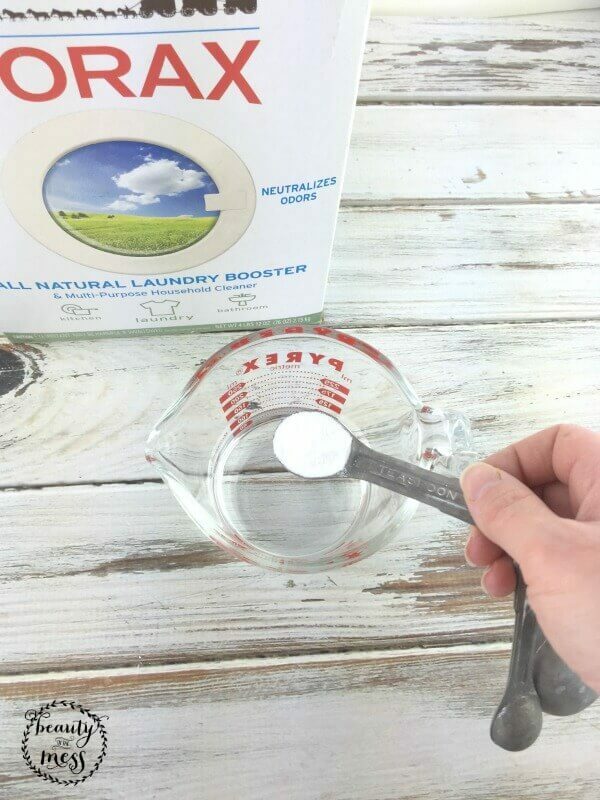 when measuring and mixing Borax, please use caution. This should be done by an adult, in my opinion. 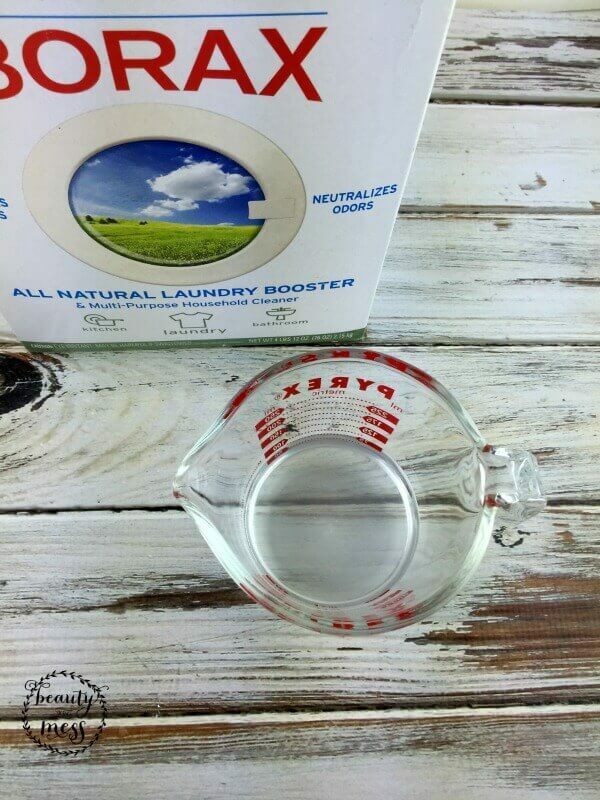 mix 1 teaspoon borax into 1/2 cup of warm water. mix well. This is a lesson in polymers. Polymers are made out of long strands of molecules, similar to a beaded necklace. Glue contains an ingredient called polyvinyl acetate, which is a liquid polymer. 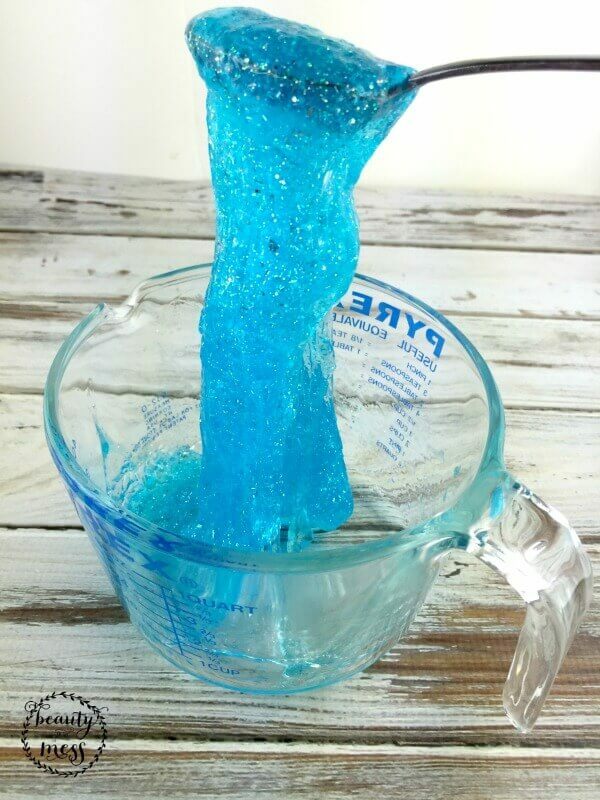 Borax helps the polymer strands stick together, creating slime. Pretty awesome! you can make bouncy balls. pull and stretch the slime. 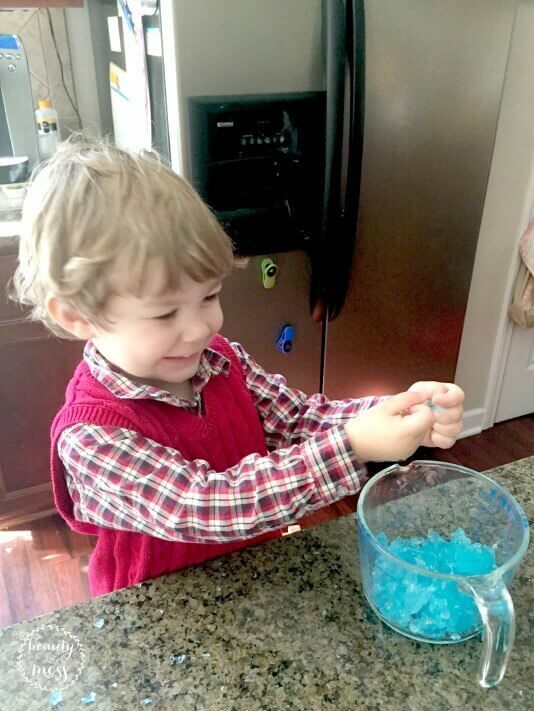 the kids have LOVED playing with the blue “Frozen” slime. Next time I’m going to try this with white glue and see if it makes a difference. 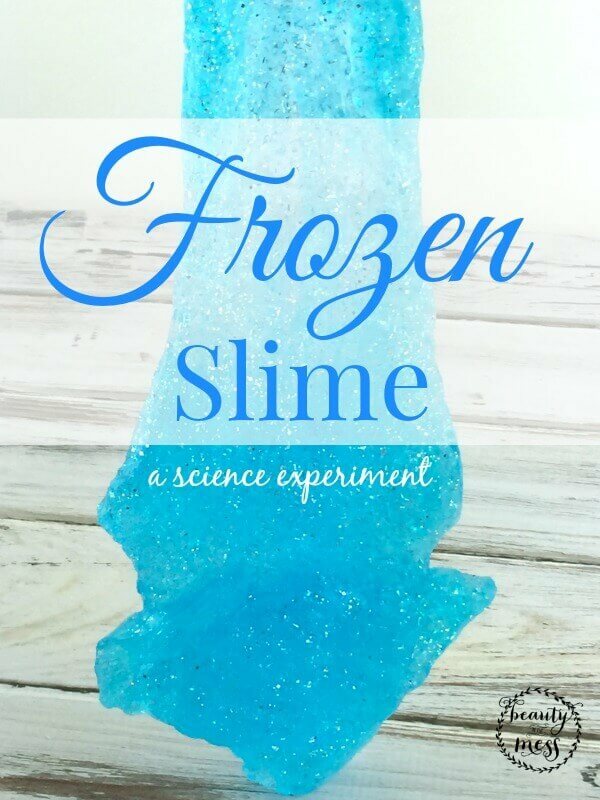 Have you made “Frozen” slime? What did you think? Did your kids love it? Our granddaughter LOVES Frozen. She dances to “Let It Go” all the time. Talk about great exercising! For the longest time, we didn’t have snow. We made Sven with the following items: Three cucumber slices for the snowballs, a mini sweet pepper for the hat, celery sticks for the arms, sliver of carrot for the nose, pecans for the eyes and buttons. Make a Sven out of veggies….so much fun! 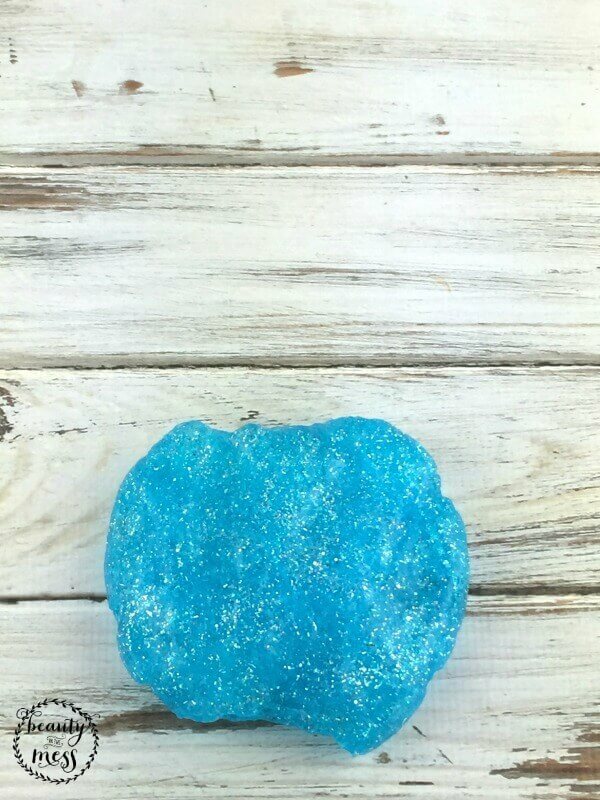 Thanks for the frozen slime idea. Definitely! We love impromptu dance parties!! I LOVE that idea. A veggie snowman!! That’s one way to get kids to get their veggies. So fun!! I can’t wait to try this one with my kids. Oh yes! My kid will love this! Can’t wait to try this with my 10 year old son. He’s going to love it! I do this activity with 60+ kids every year for a tour of a plastics company. Everyone loves it. 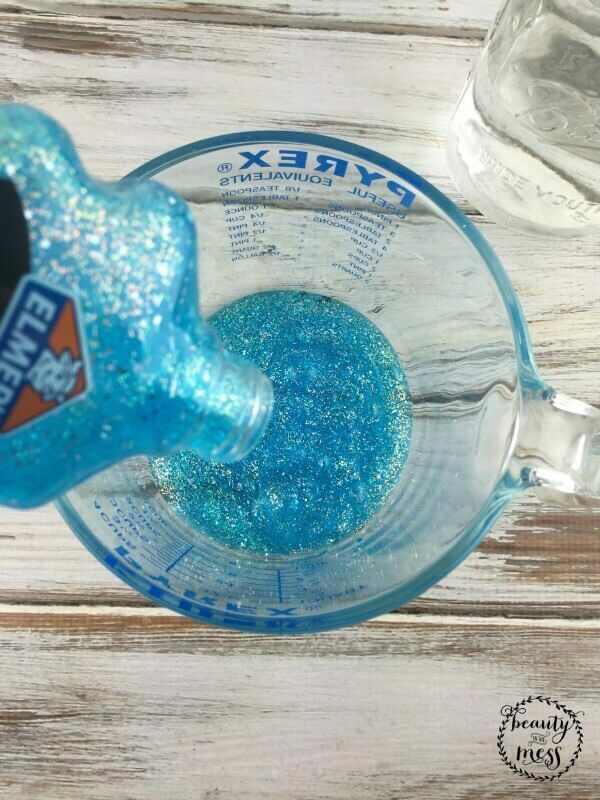 I’ve not done it with glitter glue… It generally doesn’t come in gallon jug. The white works fine. I’ve even added food coloring. how do you store this & how long does this last? Would like to know how far in advance I can make it for a class. It does dry out. I kept ours in the measuring cup at room temperature for about 3 days. I stuck it in the refrigerator to see what it would do. It’s less like slime and more like a hard gel after about a week. Still fun though :). I’m going to try it with 1/2 a teaspoon of Borax and see if it stays like slime longer. 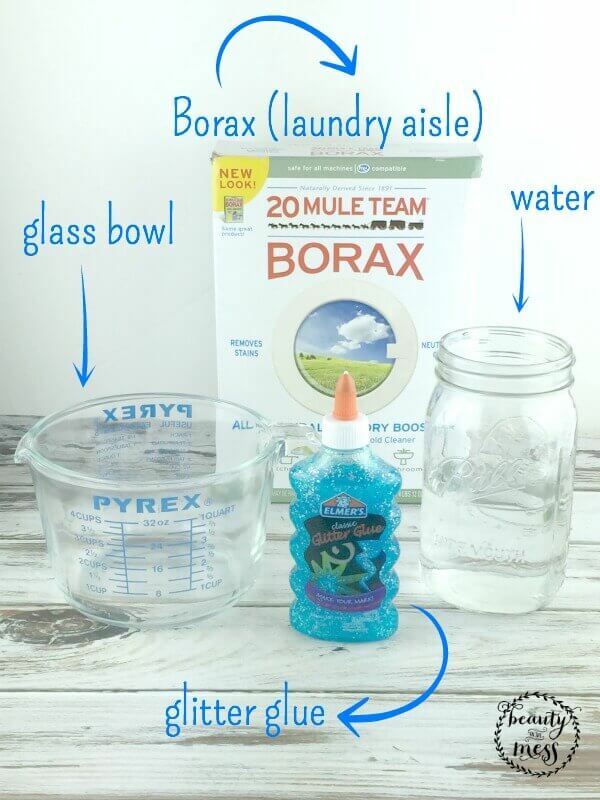 Hi what can I use instead of borax?We don’t have borax . I’ve seen contact lens solution and liquid starch.